Judicap is short for Judicial Capital – meaning The Hague. The aspiration of The Hague is to be the domicile of the International Judiciary, of Courts and Tribunals for conflict prevention and dispute settlement. This claim is the outcome of endeavours going back a full hundred years. We at Judicap can’t claim such a high pedigree. But we do identify with this ambition a full hundred percent. Our core business is precisely this ‘Hague Tradition’ of International Law and Peace Studies. To tell its history. To appraise its role and record. To evaluate its stumbling blocks. And, above all, to underpin its pertinence. Over the past fifteen years we have carried out this gospel from St. Petersburg to Perth. We have travelled the world with exhibitions, catalogues and lecturing tours. We have projected Factsheets and Flyers, and produced comprehensive Guides of all Hague-based International Organizations, Research Centres and Fora of Education. Judicap’s province is as wide as its approach is flexible. We develop databases, courses and powerpoint presentations both at the expert academic level and to serve wider educational purposes. JUDICAP emphatically seeks to bridge the gap between the world of learning and the interested layman. We have been commissioned by a palet of clients. We have worked on the request of Ministries and Museums, Embassies and Entreprises, public authorities and private associations, at home and abroad. Judicap will be proud to become YOUR partner in any way that suits your purposes best. Dr. Arthur C. Eyffinger is Classicist and Legal Historian. He was born in The Hague and was trained at Leiden and Amsterdam Universities. He started out out as researcher of the works of Hugo Grotius at the Grotius Institute of the Royal Dutch Academy of Arts and Sciences (1970-1985), then to turn to the Peace Palace and modern international law (1985). For fifteen years (1988-2003) he was on the staff of the International Court of Justice and published award-winning books on the ICJ and The Hague Tradition. He founded Judicap in 2003. Arthur Eyffinger has published extensively on humanism and the history of international law. 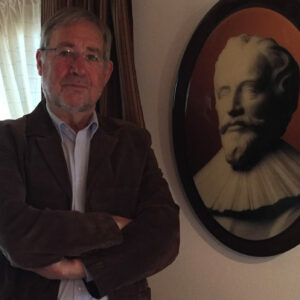 He has edited works of Hugo Grotius and other humanist scholars and has produced monographs on the Peace Palace, the Carnegie Foundation (1988, 2004), the International Court of Justice (1996), the Hague Peace Conferences of 1899 and 1907 (1999 and 2007), on Tobias Asser (2011) and on Bertha von Suttner (2013). Over the decades Arthur Eyffinger has served as president and board member of various learned institutions and as (general) editor of academic journals. Over the years Arthur Eyffinger has instigated, written and (co-)edited numerous lavishly illustrated publications in various formats, from coffee table books to highlight jubilees of institutions and historical events, to catalogues to accompany exhibitions Judicap produced. Arthur Eyffinger has produced critical editions of a variety of works in the domains of International Law, Political Science, and Letters by the Dutch humanist Hugo Grotius (1583-1648), reputedly one of the founders International Law. We at Judicap have gained ample experience with the editing of Books, Conference Proceedings, Festschrifts, and Academic Journals. International Law – The year 2019 will see the publication of Arthur Eyffinger’s major study of the life, thought and works of T.M.C. Asser (1838-1913), the outcome of a full decade of painstaking research. Grotian Studies – The year 2018 will see the publication, initially on this website, of the first issue of a series of fresh translations into Dutch of Hugo Grotius’ three biblical dramas with heavy political overtones. A core business of Judicap and a major feature to achieve its ends is the arrangement of exhibitions. They vary in nature and character and may be permanent, temporary or traveling. We have arranged expositions at home and abroad and at the invitation of public and private parties alike. A survey of exhibitions offered over past years may illustrate the wide range of options. Judicap has produced a number of powerpoint presentations and offers „Presis“ on various subjects tailor-made or readily applicable to education and research purposes at all levels, from High School to University Classes, and at short notice. Over the years 2005-2013 Judicap, at the request of The Hague Municipality, produced a whole range of (bi-annually updated and upgraded) illustrated Guides that offered a comprehensive survey of all Courts and Tribunals, IGO’s and NGO’s, International Research Centres and Fora of Education in the Hague area. These Guides included Maps and full Indexes and Reference Material. Because of the hardcopy nature of the material, a digital view is yet unavailable. More guides will be published on this website soon. We at Judicap have gained ample experience with the creation of beautiful catalogues. At the invitation of the City of The Hague JUDICAP has initiated a series of factsheets on various intenational courts and tribunals, organizations and institutions in The Hague. Whether or not in combination with the above-mentioned powerpoint presentations Judicap arranges lectures for educational purposes on a range of subjects and varying from 30 minutes to twice 45 minutes. Also offered is a series of 4 courses of 90 minutes each in which a panorama is presented of the external and internal history of Internationalism in The Hague from its earliest times up to the present day. A book and various information sheets accompany these courses which do not require any prior legal or historical training. Our website is still under construction. Therefore not all of our content is yet available. We apologise for any inconvenience that this may have caused you, and we appreciate your understanding as we continue to improve our website in the upcoming months. Is any content you are looking for on our website missing? Do you have any questions or remarks?